Forty years ago, the hockey world fundamentally was changed by the start of an eight-game series between national teams from Canada, loaded with NHL players in their prime, and the Soviet Union -- considered the two best hockey-playing nations in the world at the time -- that played out across the month of September. The series was a must-follow for hockey fans across the globe and after its dramatic conclusion --- a 4-3-1 series win for the Canadians -- there was no question that the NHL never would be the same again. This month, NHL.com looks at the historic Summit Series with a month-long collection of content. Today, NHL.com provides a look back at Game 2 of the series from some of those who helped make the history happen. Stay tuned for additional content throughout September. Game 1 saw the Soviets stun Canada by a 7-3 score. The festive atmosphere that surrounded Game 1 of the Summit Series was nowhere to be found in Game 2. The 16,485 fans who filled Maple Leaf Gardens in Toronto had seen the Soviet "amateurs" slice up the best the NHL had to offer in the series opener, and players and fans now knew this was going to be a lot tougher than anyone had thought possible. With a new lineup and a new philosophy, Canada evened the 1972 Summit Series at one win apiece with a solid 4-1 victory against the Soviet Union in Game 2. Second Period: 1, Canada, P. Esposito 2 (Park, Cashman), 7:14. Third Period: 2, Canada, Cournoyer 1 (Park), 1:19 (pp). 3, USSR, Yakushev 2 (Liapkin, Zimin), 5:53 (pp). 4, Canada, P. Mahovlich 1 (P. Esposito), 6:47 (sh). 5, Canada, F.Mahovlich 1 (Mikita, Cournoyer), 8:59. Shots on Goal: Soviet Union 7-5-9--21. Canada 10-16-10--36. Goalies: Soviet Union, Tretiak 1-1-0 (36 shots on goal, 32 saves). Canada, T. Esposito 1-0-0 (21-20). Team Canada coach Harry Sinden knew it too -- and he also knew he had to make some changes to the lineup that had been routed in the series opener. The team that took the ice in Toronto on Sept. 4, 1972, had nine different players than the one Sinden iced for Game 1; the entire "GAG Line" -- Jean Ratelle, Rod Gilbert and Vic Hadfield, who had powered the New York Rangers to the Stanley Cup Final four months earlier -- was benched. 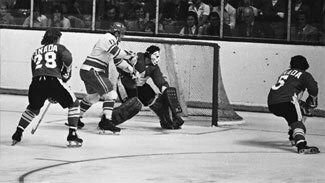 Ken Dryden, the 1971 Conn Smythe Trophy winner who was riddled for seven goals in Game 1, also took a seat as Tony Esposito got the call. The goaltending change, in particular, seemed to make a difference. "Tony Esposito had a great game that night," Team Canada forward Paul Henderson told NHL.com. "Ken Dryden had a tough night in Game 1. When he thought they were going to pass, they would shoot, and when he thought they were going to shoot, they passed. He had never seen anything like it before, and it unnerved him. Tony was better against that style." More important was Team Canada's change in its style of play. Instead of trying to skate with the Soviets, the Canadians went back to basic, physical North American hockey. By simplifying their game -- being more aggressive on the forecheck, tighter in their defensive zone -- the Canadians made life easier for Esposito and much tougher on their opponents. "All through training camp, I don't think we really put enough emphasis on defense," Montreal Canadiens defenseman Serge Savard, who excelled in Game 2 after sitting out the opener, said. "All the time, it was goals, goals, goals ... how many goals are we going to beat them by? But in this game we brought some defense into the game." It was the kind of hockey the Soviets hadn't been exposed to in international play, which still featured limits on hitting. "They were more respectful of us in the second game," Soviet captain Boris Mikhailov said. "They understood that we could play good hockey. They played very well, a very physical game. We had not seen such a style of game." The Canadians dominated the first period, but were frustrated by the play of 20-year-old goaltender Vladislav Tretiak, who was showing that his performance in the Soviets' 7-3 win in Game 1 was no fluke. He stopped all 10 Team Canada shots in the opening 20 minutes and kept his team in the game in the second, allowing only a goal by Phil Esposito while making 15 saves. Canada's 1-0 lead after two periods belied its 26-12 advantage in shots on goal that was a good reflection of the play. "Enjoy the victory, but don't gloat over it. We've got six games to play. Enjoy it tonight, savor it, but we've got a lot of games to play." Yvan Cournoyer sped past the Soviets for a power-play goal 1:19 into the third period for a 2-0 lead, but Alexander Yakushev -- a power forward who was making a big impression on the Canadians -- got that one back with a power-play goal of his own at 5:53. When Pat Stapleton took a hooking call 21 seconds later, the Soviets had a chance to get even. Instead, the Mahovlich brothers took over. First, Peter Mahovlich scored a spectacular shorthanded goal at 6:47 to restore Canada's two-goal lead. He picked up a clearing attempt by Esposito at center ice, deked a defender and faked a forehand shot before slipping the puck past Tretiak while falling over the goaltender. Big brother Frank's one-timer off a pass from Stan Mikita just over two minutes later put the icing on a 4-1 victory that evened the series -- and sent a sigh of relief throughout Canada. "We felt a lot better," Henderson said. Still, despite the solid win and a 36-21 advantage in shots on goal, Sinden told his celebrating players afterward that there was a long series ahead of them. "Enjoy the victory, but don't gloat over it," he said after the game. "We've got six games to play. Enjoy it tonight, savor it, but we've got a lot of games to play."